Two years ago, my husband and I dined at Watermarc for the first time. It was a last minute decision as we were looking for a place to have dinner before the Pageant of the Masters in Laguna Beach. As we headed towards the restaurant, we walked past a small little gelato shop that smelled amazing, looked incredible, and had a line out the door. Those three things spoke volumes about how terrific this shops gelato must have been. I told my husband I wanted to try it, and we agreed that when we came back to our car after the Pageant of the Masters was over, we’d grab a cup of gelato to enjoy before heading home. Sadly, by the time we left the show and walked back to center where the gelato shop was, they had just closed for the evening and were cleaning up. I remember telling my husband that we had to make plans to come back again to try this place’s gelato. Fast forward in time now, my husband and I had made impromptu plans for a quick one-night getaway to the St. Regis Monarch Beach in Dana Point. Since Laguna Beach was on the way down to Dana Point, we decided to make a day out it. That meant lunch at Watermarc, and finally, dessert at Gelato Paradiso. 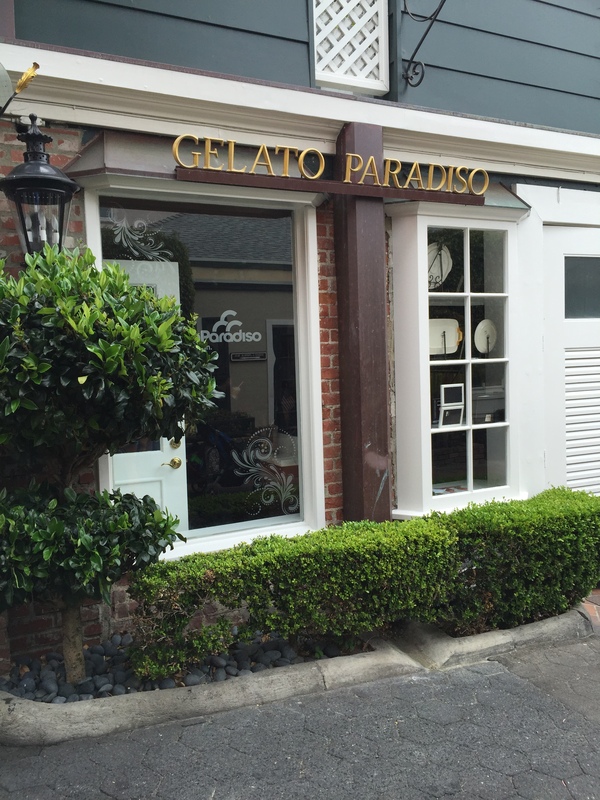 Priding itself as an authentic Italian gelateria, Gelato Paradiso opened its doors in 1999 with the idea of bringing the wonders of Italian gelato with secret Sicilian recipes and ingredients imported from Italy to California. Everything within the store is as authentic as can be, from the equipment, to the recipes, to the training, to the cups and spoons and the marble counters and tile all the way to the artwork that decorates the walls, everything is brought in from Italy. 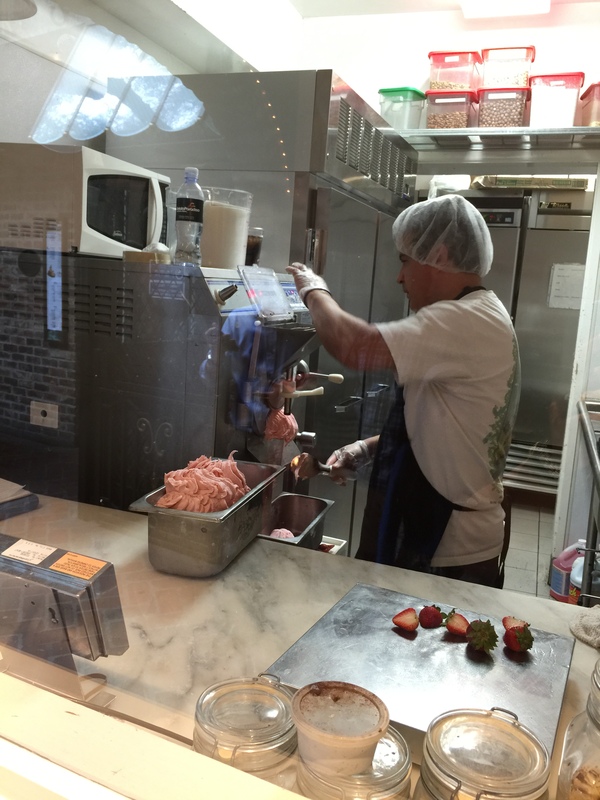 Gelato Paradiso prides itself in only using the finest, fresh ingredients. 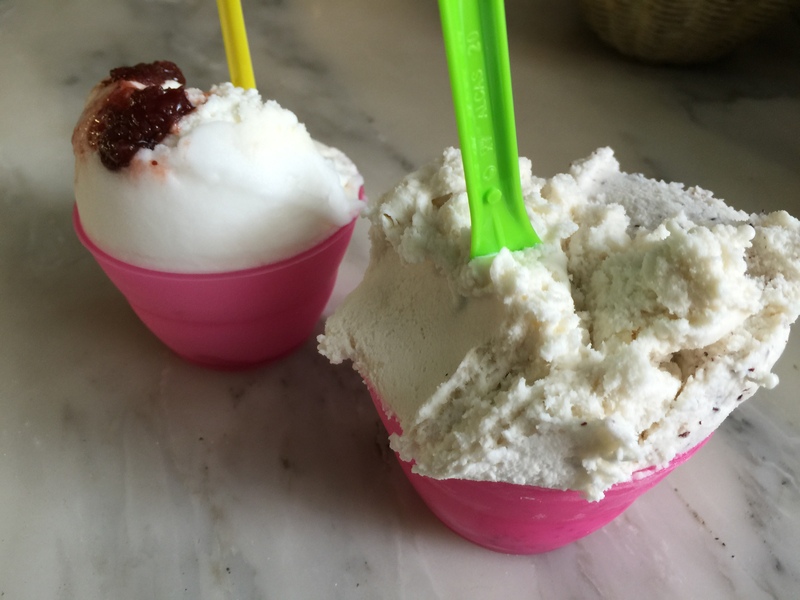 There are no artificial powders or syrups that are used to make their gelatos and sorbettos. Only fresh fruits, extracts and artisanal cocoas are used by master artisans who have trained with the best gelatoias in Sicily. Each flavor in the store is handmade in small batches on a daily basis to preserve quality and freshness that you just can’t replicate. Gelato Paradiso also has an open kitchen where you can watch the gelato maker making small batches of the gelato that will be served inside the store. 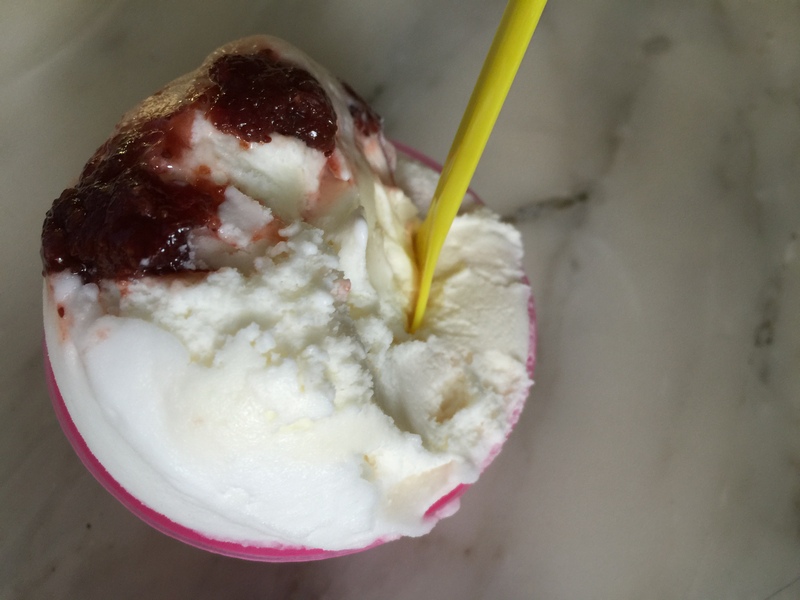 When we were at Gelato Paradiso, they were preparing a batch of sorbetto del fragola, better known as strawberry. You could see the fresh, ripe strawberry being cut up and put into the gelato mixture before it was poured into the ice cream maker, and the deep, rich pink color of the strawberry gelato as it comes out of the machine and into a small metal bowl ready to be put out on display and scooped into cups for the customers enjoyment. 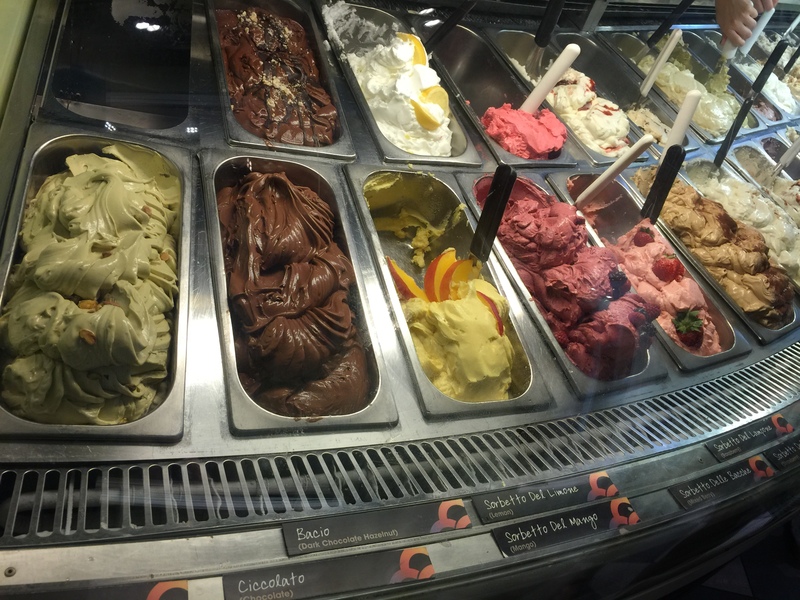 There were so many different flavors of gelato to choose from it was hard to know where to start or what to order. The display case had so many different colors and textures and flavors and pieces of fruit and was just an explosion of rainbow colors it was almost overwhelming to know where to begin. Every single flavor looked amazing. If I wasn’t full from lunch, I might have decided to try a little bit of every flavor. Is that so wrong? There was pistacchio (pistachio) and bacio (dark chocolate hazelnut), sorbet del limone (lemon), and ciccolato (chocolate), and everything looked amazing. I loved how they also used the authentic Italian name for each flavor. Sorbetto del mango (mango) with its slices of fresh mango looked mouthwatering, especially since mango is one of my favorite fruits. Sorbetto del lampone (raspberry), and sorbet delle bacche (mixed berry) had such amazing vibrant colors. Moving down the line, there was fragola e crema (strawberries & cream), nicciolina americana (peanut butter), noce di coco (coconut) and gianduia (milk chocolate hazelnut). I thought for sure that my husband was going to order coconut when I saw it because he’s a huge fan of all these tropical fruit flavors. But, he ended up surprising me by ordering something I’d never guess he would order. Caffe (espresso), would definitely be something that would interest me. Dulce de leche (sweet cream and caramel), menta (mint chip), cookies & cream (Oreo), stracciatella (chocolate chip), nocciola (hazelnut) and doppio cioccolato (double chocolate) were also on display. Other flavors included mandorla (toasted almond), banana, and vaniglia (Italian vanilla). The gelato is served in cups or cones. The cups come in small, medium and large size. And each size cup can hold multiple flavors of gelato. You could also get either a small or large waffle cone. The waffle cones are made fresh daily at the store and when you enter the store you smell the waffle cones cooking immediately. The scent just permeates the air. Because my husband and I had both just come from a filling lunch, we each decided to just get a small cup of gelato with two flavors. My husband got the lemon and the strawberries & cream. The lemon I understand, but the strawberries & cream surprised me. However, my husband thought that the sweetness of the strawberries & cream would pair better with the lemon, and it probably was the right choice. The lemon was tart and tangy, exactly what my husband was looking for. This was straight lemon juice turned into a sorbetto without any added sugar or flavors. So the slight sweetness of the strawberries & cream really balanced out the flavors of the lemon. The strawberries & cream had strawberry preserves folded into it adding the sweetness from the macerated strawberries. My husband was surprised and delighted by how much he enjoyed the strawberries & cream. I ordered a small with banana and stracciatella. 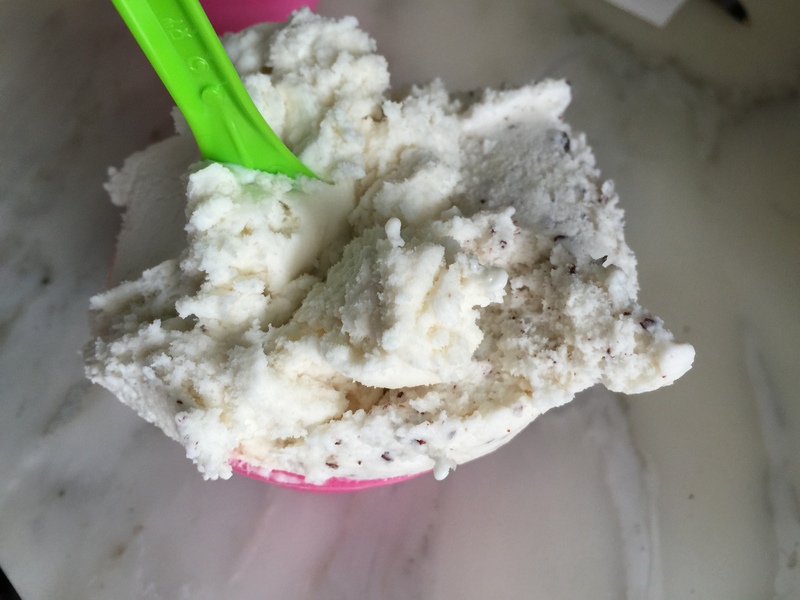 I’m a chocolate chip lover, so I can’t pass up an opportunity to order straciatella, even though I know it’s probably the most boring flavor you could ever get with gelato. What I love is that it’s obvious that this was chocolate chip made the right way, with ribbons of melted chocolate poured into the gelato as it was being churned so that when you eat the gelato, you get ribbons of frozen chocolate interspersed through the vanilla gelato rather than getting “chips” of chocolate as chocolate chip would indicate. And of course, banana, I can’t resist. My all time favorite fruit, when I see it in ice cream or dessert, I know I have to order it. Again, the banana was done the right way made with ripe bananas and no added food coloring or sugar. When banana gelato comes out a pale white or grayish color, you know it was made with fresh bananas rather than banana food coloring and flavoring. And this banana was fantastic. It was sweet, but not over-the-top sweet. The gelato definitely had the banana flavoring that was distinct and lovely. The banana and straciatella really paired well together. After two years of waiting, I’m so glad we finally got to try Gelato Paradiso. My only complaint was that I was so full from lunch I wish I had arrived at Gelato Paradiso with an empty stomach so that I could enjoy more of their delicious gelato. 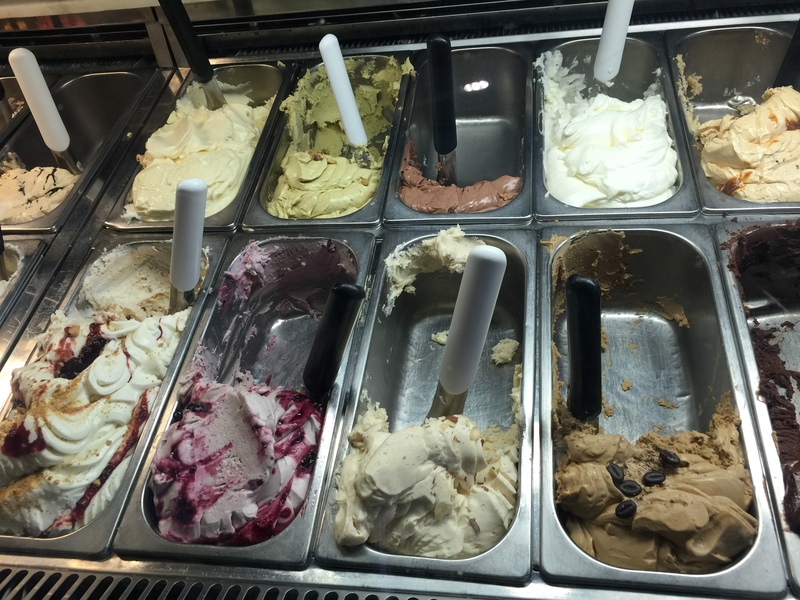 Both my husband and I really enjoyed the gelato flavors we ordered, but we both saw so many other flavors being offered that we would have loved to try. The gelato was creamy, rich and oh so delicious. 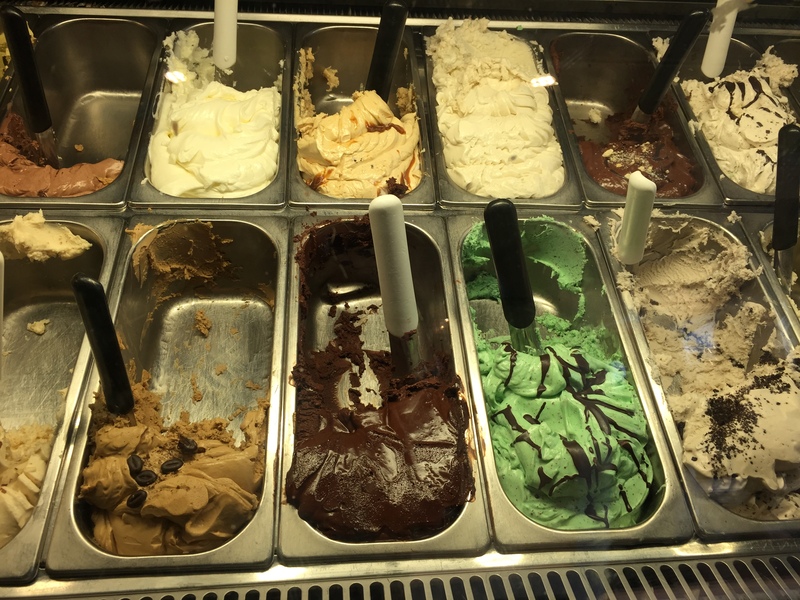 I loved being able to watch the gelato maker make the gelato and then seeing the different flavors in their trays on display inside the store. The store smelled fabulous and mouth-watering the gelato was that good. 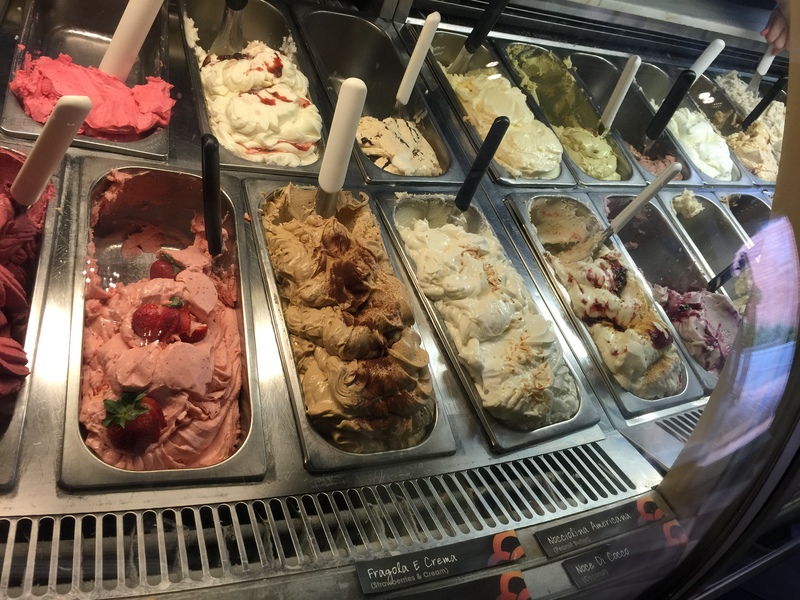 I can see why Gelato Paradiso is so popular, especially on a hot summer day walking along the beach? This is the perfect beat-the-heat guilty pleasure.